You can use the Manage Smart Cards page to perform many of the operations that can be applied to one of the cryptographic keys stored on the token. You can use this page to format the token, set and reset the card's password, and to display card information. Two other operations, enrolling tokens and viewing the diagnostic logs, are also accessed through the Manage Smart Cards page. These operations are addressed in other sections. When you format a smart card, it is reset to the uninitialized state. This removes all previously generated user key pairs and erases the password set on the smart card during enrollment. The TPS server can be configured to load newer versions of the applet and symmetric keys onto the card. The TPS supports the CoolKey applet which is shipped with Red Hat Enterprise Linux 6. Insert a supported smart card into the computer. Ensure that the card is listed in the Active Smart Cards table. 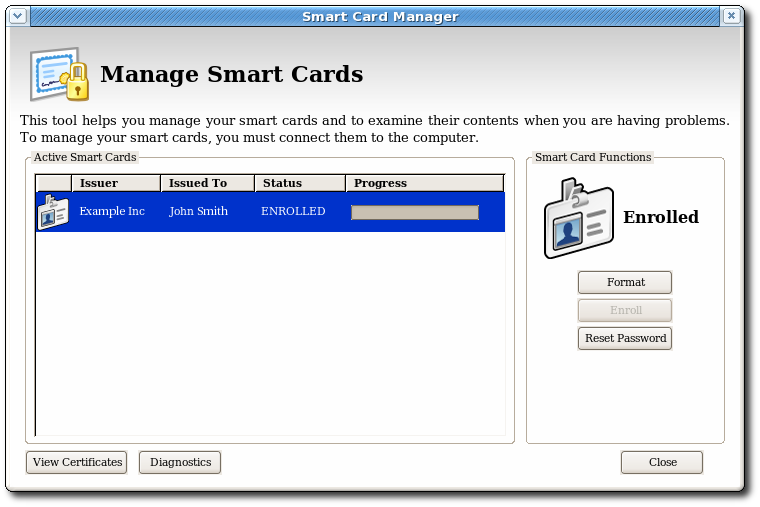 In the Smart Card Functions section of the Manage Smart Cards screen, click Format. 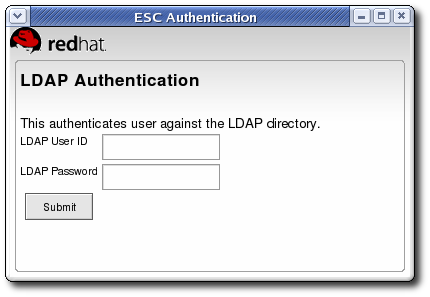 If the TPS has been configured for user authentication, enter the user credentials in the authentication dialog, and click Submit. During the formatting process, the status of the card changes to BUSY and a progress bar is displayed. A success message is displayed when the formatting process is complete. Click OK to close the message box. 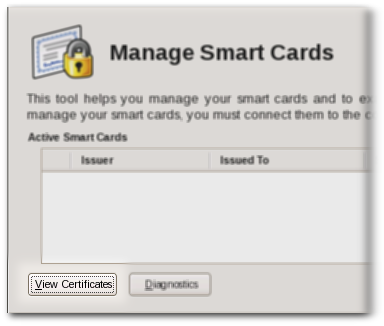 When the formatting process is complete, the Active Smart Cards table shows the card status as UNINITIALIZED. 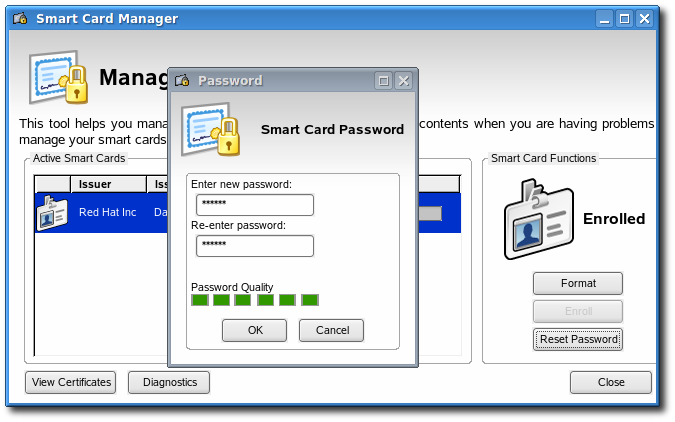 In the Smart Card Functions section of the Manage Smart Cards screen, click Reset Password to display the Password dialog. Enter a new smart card password in the Enter new password field. Confirm the new smart card password in the Re-Enter password field, and then click OK. Wait for the password to finish being reset. Select the card from the list, and click View Certificates. 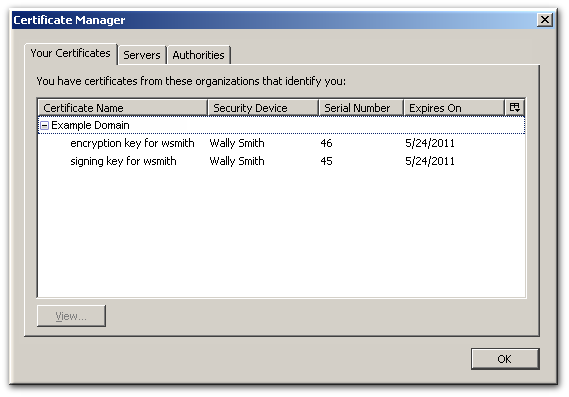 This displays basic information about the certificates stored on the card, including the serial number, certificate nickname, and validity dates. To view more detailed information about a certificate, select the certificate from the list and click View. The XULRunner Gecko engine implements stringent controls over which SSL-based URLs can be visited by client like a browser or the Enterprise Security Client. 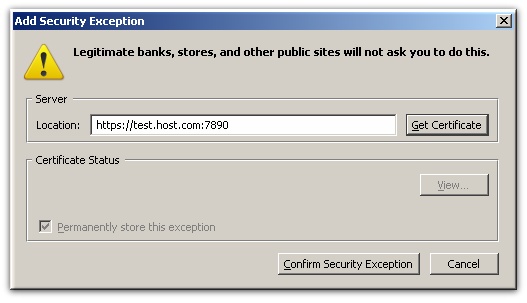 If the Enterprise Security Client (through the XULRunner framework) does not trust a URL, the URL can not be visited. Any CA which issues certificates for smart cards must be trusted by the Enterprise Security Client application, which means that its CA certificate must be imported into the Enterprise Security Client. Open the CA's end user pages in a web browser. Click the Retrieval tab at the top. In the left menu, click the Import CA Certificate Chain link. Choose the radio button to download the chain as a file, and remember the location and name of the downloaded file. 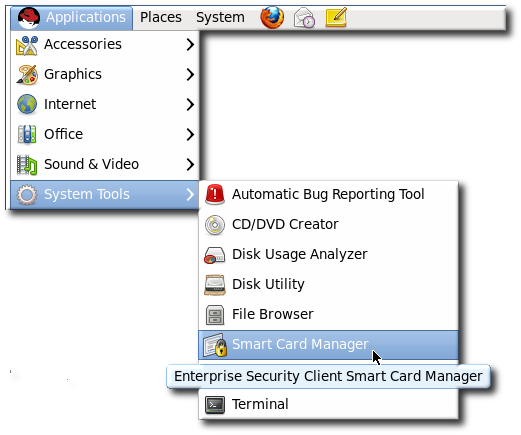 Open the Smart Card Manager GUI. 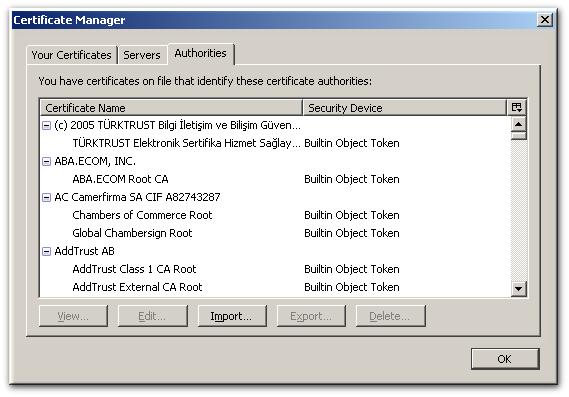 Browse to the CA certificate chain file, and select it. When prompted, confirm that you want to trust the CA. The smart card can be used to access services or websites over SSL that require special security exceptions; these exceptions can be configured through the Enterprise Security Client, similar to configuring exceptions for websites in a browser like Mozilla Firefox. Enter the URL, including any port numbers, for the site or service which the smart card will be used to access. 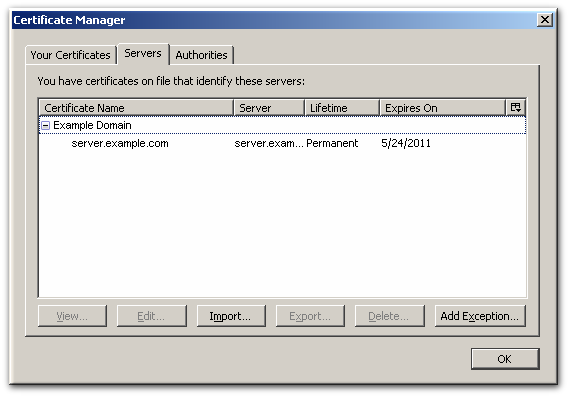 Then click the Get Certificates button to download the server certificate for the site. Click Confirm Security Exception to add the site to the list of allowed sites. Most smart cards will be automatically enrolled using the automated enrollment procedure, described in Section 5.3, “Enrolling a Smart Card Automatically”. You can also use the Manage Smart Cards facility to manually enroll a smart card. If you enroll a token with the user key pairs, then the token can be used for certificate-based operations such as SSL client authentication and S/MIME. The TPS server can be configured to generate the user key pairs on the server and then archived in the DRM subsystem for recovery if the token is lost. Insert a supported, unenrolled smart card into the computer. Ensure that the card is listed in the Active Smart Cards table. Click Enroll to display the Password dialog. Enter a new key password in the Enter a password field. Confirm the new password in the Re-Enter a password field. Click OK to begin the enrollment. If the TPS has been configured to archive keys to the DRM, the enrollment process will begin generating and archiving keys. When the enrollment is complete, the status of the smart card is displayed as ENROLLED.